Tonight will be mostly clear inland, but fog will extend along the coast and move locally across the bay. Overnight lows will be mainly in the low to mid 50s. Then more sun Friday to kick off the weekend. Tonight will be mostly clear inland, but fog will extend along the coast and move locally across the bay. Overnight lows will be mainly in the low to mid 50s. 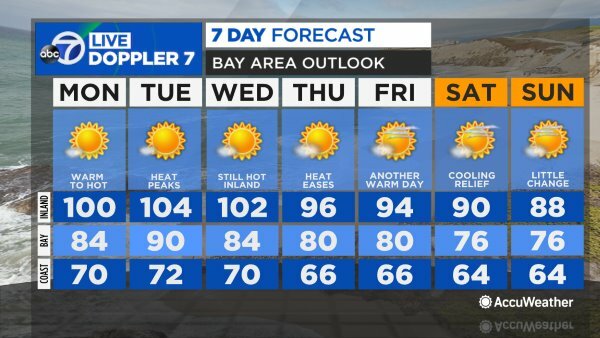 Tomorrow will be mostly sunny and mild to warm again near the bay and inland; but it will be cooler at the coast, as fog lingers through the day. Saturday will be cooler in all areas, but we can expect sunnier and milder weather on Easter Sunday.